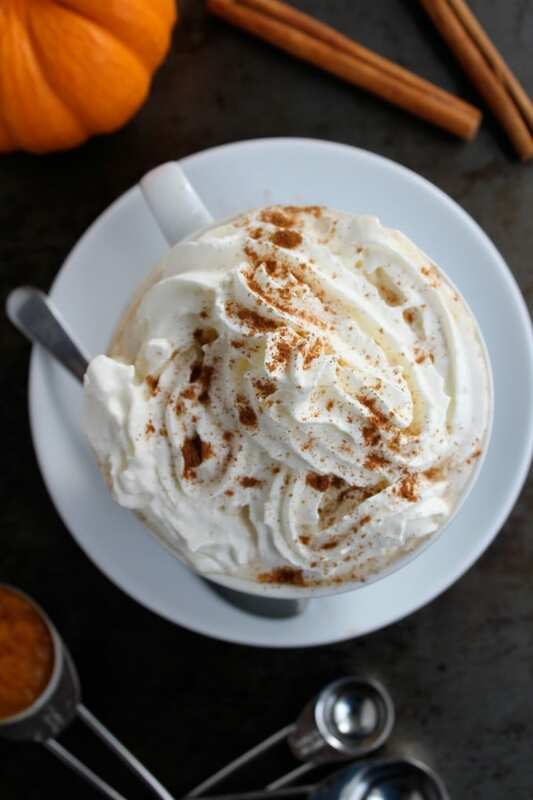 Please don’t hate me for being so early, but in honor of the first official day of fall, I thought I’d share my version of a dairy free pumpkin spice latte. Once upon a time I worked a Starbucks through one hectic holiday season, which was long enough to see just how crazy people go for those red holiday cups. Really….ya’ll go bat$hit. I know the PSL has been back for weeks now at Starbucks, and white girls everywhere are rejoicing at the return of their beloved beverage. With that said, excuse me this one time as I jump onto the bandwagon and recreate a dairy free version of the infamous drink using actual pumpkin that my amazing sister-in-law sourced for me – thanks, Kathryn! Who knew finding pumpkin puree here in the UK would be so difficult? 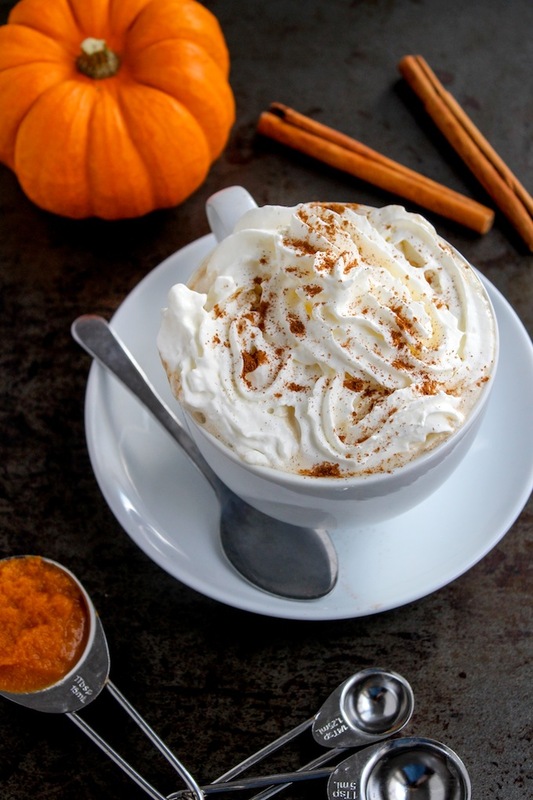 I’ve also included how to turn it into a more grown up version – a pumpkin spiked latte. Ah, yesss. A couple days ago, I was surprised to hear from Mike about a post going around Tumblr warning Vegans and lactose intolerant folk alike that the PSL syrup contains milk products. I did a bit of digging and found out that anything made with the syrups mentioned below contain milk products and should be avoided by anyone who can’t have dairy. Technically, this isn’t a latte because lattes are made with espresso and steamed milk – basically they are milkier cappuccinos with less foam. Because I don’t own an espresso machine and I know most people don’t, I use freshly brewed strong coffee and coconut milk warmed in a sauce pan with the pumpkin spice. 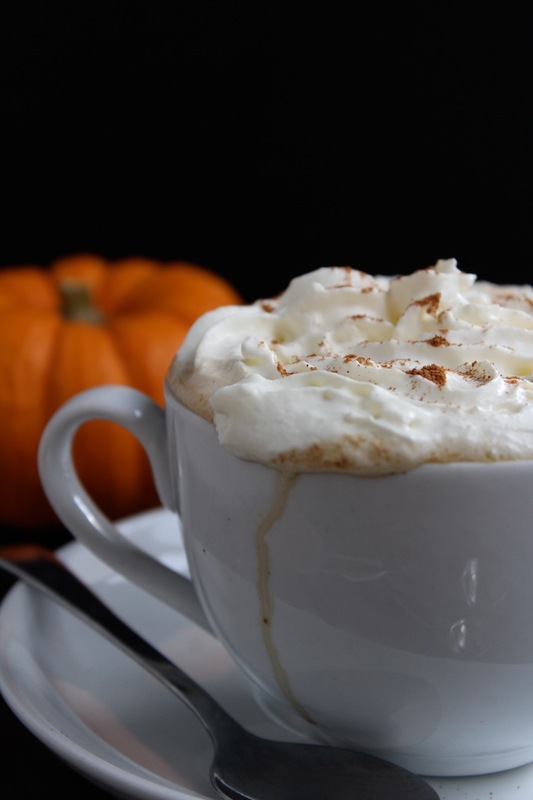 Instead of using a steamer as they do for the original PSL, use your blender to recreate that coffee shop foam. This recipe only requires 2 tablespoons of pumpkin puree, so cover the pumpkin and save in the fridge for up to three days, or even better, measure out two tablespoons at a time and freeze for future use. I’ve also got a one bowl pumpkin bread recipe + pumpkin cookies coming up soon to use the left over pumpkin, so no worries about waste. If you want to take this drink to an entirely new level, substitute the vanilla extract for dark rum. I’ve heard whisky is a good option too, but depending on who you ask whisky may not be suitable for Coeliac’s. By the way, if the amount of vanilla extract seems like a lot for the amount this makes, that’s because it is. However it is necessary for mimicking that syrup that goes in the Starbucks original. So yay for hot drinks on cold days that warm your hands that also happen to smell amazing. Still friends? Begin making coffee as you normally would. In a small sauce pot warm the pumpkin puree, vanilla, cinnamon, ginger, cloves, and nutmeg on a medium low heat. Grind a generous amount of pepper into the mixture and stir on low heat for about 2 minutes until the mixture is hot and fragrant. Add the sweetener and the coconut milk and continue stirring until the mixture comes to a simmer. Remove the pan from the stove and blend the pumpkin spice mixture in a blender for about 30 seconds or until it begins to get a bit frothy. Divide the coffee you made previously between two cups. 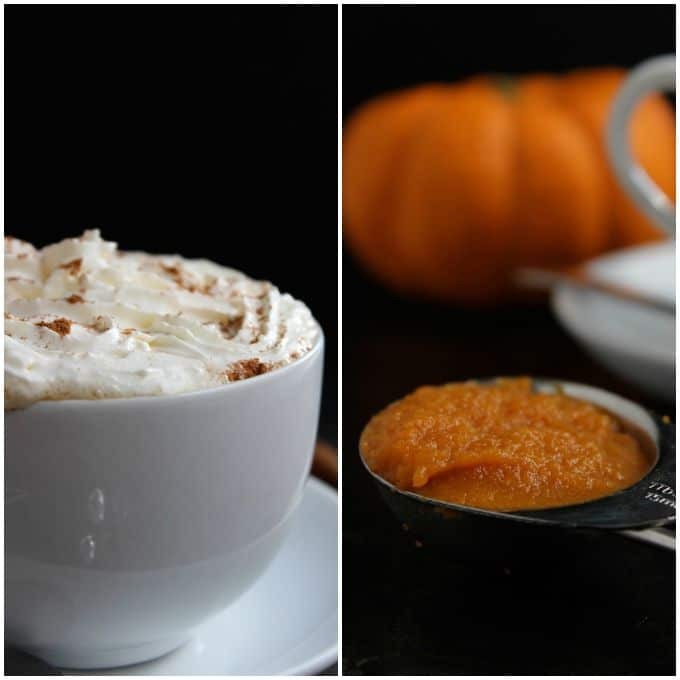 Pour the frothy milk mixture into each cup, top with a healthy dose of coconut whipped cream because you deserve it and then sprinkle with cinnamon. One last thing! I used this tutorial on making coconut whipped cream if you’re interested. To get the swirly look I pipped it out of a pastry bag with a star tipped pipping nozzle. I’m neither a yoga mom nor a teenage girl, but I get super excited by the words “pumpkin spice”. 🙂 Thanks for linking this up to Merry Monday! Haha, you and I both – it’s hard not to love it! Yum! This looks amazing! Thanks for linking up with What’s Cookin’ Wednesday! I could go for one of these this morning! Your pictures are gorgeous…mouthwatering! Thanks for sharing it with us at #FoodieFriDIY…pinning and sharing! Aww, thanks Michelle! And thanks for sharing too! Loved this week’s FoodieFriDIY! I guess I really need to come to terms that summer really is over… This latte sounds like the perfect thing though for the coming cooler months, especially with the real pumpkin and ground pepper! So much tastier than what we can get at the local Starbucks I’m sure! I’d be more sad that summer is over if it actually felt like summer here. I’m so used to HOT summers with lots of sun…Sheffield doesn’t get that so much. Although if you asked anyone here they’d probably punch me for saying that haha. The ground pepper makes such a difference! I made it one day and I couldn’t figure out what was different about it until I realized I forgot the pepper. So good – and yes -sooo much cheaper!